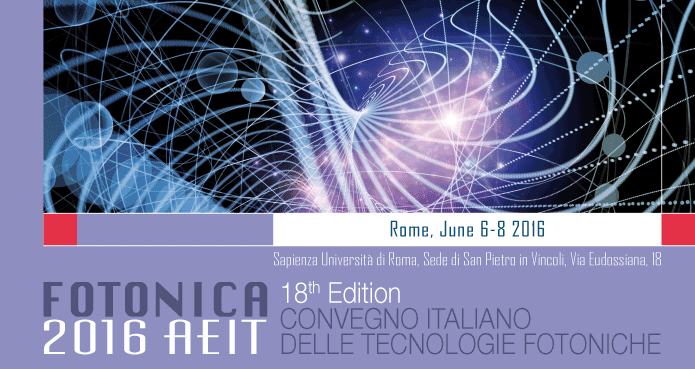 INPHOTEC participated at 18th edition of FOTONICA 2016 – the Italian Conference on Photonic Technologies – held in Rome, at the University “La Sapienza” from June 6 to 8. FOTONICA is an annual conference where international photonics communities meet together to present and discuss the most advanced scientific and technological research results in all areas of photonics, with great emphasis on its applications. Sergio Doneda – General Manager and front-end coordinator of INPHOTEC – presented the center and its activities at the symposium entitled “Photonics technology as an incubator of industrial Initiatives in Italy”: a plenary session about the current framework, national and international initiatives and prospects of photonics development. INPHOTEC was also present at the Technical Exhibition with a stand and a slot to present their technologies and solutions. To Giovan Battista Preve – INPHOTEC packaging Manager and TeCIP Institute affiliated – the task of describing the current state of the art of INPHOTEC packaging line, able to develop and produce up to thousands of devices in a year, thus supporting with an industrial approach the international community working in photonics: public institutions, small-medium and large enterprises. FOTONICA has been also the best opportunity to launch the new collaboration between INPHOTEC and Linkra – MICROTECH division sanctioned by the two-year agreement signed by the Institute Director, Prof. Giancarlo Prati, and Dr. Michel Delagarde, CEO of the well-known company.